Badger Badger Badger Badger Badger GOOOOOOOOOOOOOOOOOO Badgers! (Have I mentioned I'm a die-hard Badger??) Yup, that was the overall theme of this weekend. After a quiet night at home on Friday, we got up early and headed to Madison for Homecoming. 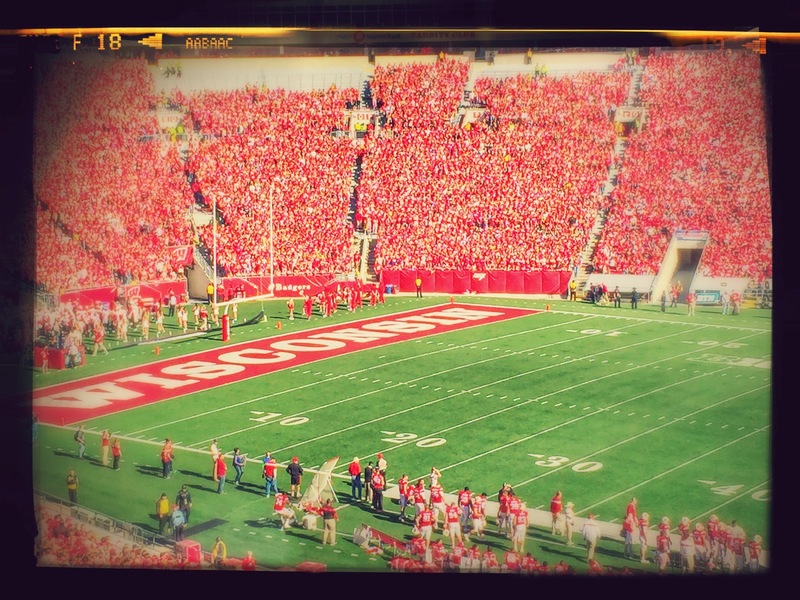 An 11:00am game meant an early morning but it was totally worth it to watch the Badgers blow Maryland out of the water. By the end of the 3rd quarter, it was such a blow out that we were kind of bored. So the girls visited Bucky's Locker Room for a little bit of Badger shopping. I now have quite a few items on my wishlist, this being just one of them. After the game, it was time to tailgate! Yup, we do thing a little backwards when it is a morning game. As usual, my aunt and uncle totally spoil us! It was quite the spread! Finally, it was getting close to 6:00pm, which meant it was time to head home to pick up the pup from doggie day camp and collapse. I think I was asleep before 10pm. A very large portion of Sunday looked like this before I mustered up the motivation to do some laundry and clean out some closets. I love my new Badger PJ pants. I really wish I was at home in them now. Sundays are for wearing pjs :) Looks like a fun game - love all the school spirit! Football weekends are the best!! Your Sunday before the chores looked amazing! !